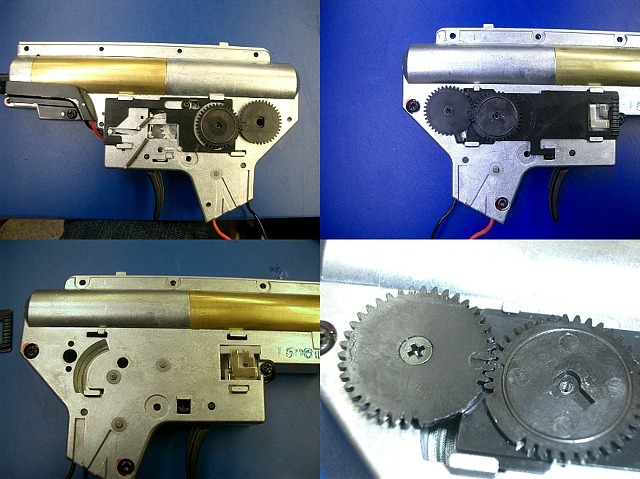 Tokyo's First Version Gearbox, only available in the Famas. The Version 2 Gearbox is the second version designed originally by Tokyo Marui. Since Tokyo Marui designed this gear box it has been re-designed by several companies to be more reliable with after market parts but still retains the basic mechanicals and design as the original Tokyo Marui version 2 gearbox. There are three common forms of the Version 2 gearbox. The first type features a window towards the rear of the gearbox, with the spring visible. This is found in all Armalites that use the Version 2 gearbox, as the window allows the body tabs of the receiver to pass over the raised portion of the gearbox. The second type of Version 2 gearbox lacks this window, and is generally found on non-Armalites. While the windowed style of the Version 2 can be used in non-Armalites, the non-windowed version cannot be used in Armalites due to the lack of space for the body tabs to pass over the gearbox. The third type of the version 2 gearbox is by ICS and is able to be seperated into two halves, which makes swapping out the top portion for switching from a higher fps outdoor gearbox to a lower fps indoor/cqb gearbox much more simple. from a high rated primary spring. Higher chance of motor misalignment, as it is not mounted to the gearbox (as in other versions), and so not as precise. The Version 3 is considered among the best, if not the best gearbox design available, due to its durability regarding high-powered upgrades and the wide availability of aftermarket parts. It is characterized by its retainer plate on the top of the gearbox (used in place of screws), its thicker shell, and its motor cage. The SIG family of replicas DO NOT use a NORMAL version 3 gearbox. They accept version 3 parts, but are different in many ways. They look similar, but the SIG gearbox, like the version 2 gearbox uses the heat sink in the pistol grip to support the motor and does not have a motor cage. Furthermor, the SIG gearbox has a very unique fire selector. This gearbox is only available in the TM Uzi. Unlike previous versions, the wiring and switch assembly of the version 6 gearbox is attached on the outside of the shell, making it relatively easy to upgrade gearbox components. It uses standard gears, but may be unable to use higher torque gears without modification. The anti-reversal latch, unlike the version 2 and 3 is located on the right side of the spur gear. And depending on the spur gear and shimming applied, the anti-reversal latch may require shimming and modification in order to prevent the spring from contacting with the spur gear. Also, the bushing for the spur gear has an oblong shape. The cylinder head, like previous versions is different for the version 6, the nozzle being positioned above the cylinder's center line. As with previous versions, the version 6 gearbox uses the standard piston and spring set by Tokyo Marui. This means the version 6 can use aftermarket pistons for versions 2 and 3, although some manufacturers such as Systema and Angel released their own version 6 pistons. Version 2 spring guides can be used, but a version 6 spring guide is also available. Standard aftermarket cylinders can also be used. The version 7 gearbox, like the version 6 gearbox, has its wiring and switch assemblies mounted on the outside of the gearbox shell. This makes it much easier to close the two halves of the gearbox, since there are no awkward trigger parts (usually slightly misaligned due to spring loading) to contend with. Yet unlike the version 6, the switch mechanism is divided into several parts, complicating the upgrading process for the untrained. While being one of the newest gearbox designs from the Tokyo Marui, it does not appear to be definitively superior in durability when compared to previous versions of gearboxes, especially the vaunted Version 3. Despite the relative youth of the gearboxes involved, there are a number of reports of Version 7s cracking at the front, around the cylinder head. This appears to be happening on even 1.2J springs. While all the bushings are compatible with previous versions, the cylinder is slightly longer, and the spur gear is noticeably smaller than the standard spur gear. These require parts made specifically for the version 7 gearbox. On the other hand, the version 6 spring guide can be used in the version 7. It is unique in that it features a mechanical burst function. Also it is only found in the TM Type 89. Dancing with the Devil in the pale moon light. Last edited by randaltothereed; 06-22-2010 at 03:22 PM. Not even that Spectre, its that he just copy pasted someone else's guide from another site, presumably with out permission. This is a V1. I've had them apart several times. Last edited by Kraken; 06-22-2010 at 11:38 AM. I agree, first picture looks like a V7 gearbox. Thanks kraken, I couldn't seem to find a picture of an Uzi gearbox though.